Tiki Mondays reunites Elettaria tiki night alums on both sides of the stick with head pirate Brian Miller crafting a special cocktail menu of tiki classics. 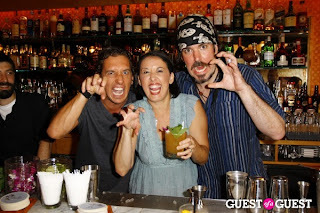 The list of concoctions include the Donn Beach's 1934 Zombie, the Cobra's Fang, both Caribbean and Tahitian Rum Punch, Navy Grog, and Rum Barrels. A rotating group of guest bartenders (expect more Elettaria ex-pats) accompany Miller dishing out swizzles for your pleasure. We hear Jim Kearns is up next week. So bust out the Hawaiian prints and start off the week in paradise! Meanwhile, Astoria is putting itself on the cocktail map with the opening of the Astor Room. Listen to the authentic sounds of Exotica from the legendary Fisherman’s Tiki Trio while you enjoy classic rum cocktails and tiki –inspired dishes in one of the most historic watering holes in New York City! With special guests Bunny Love and Ekaterina for your tropical entertainment.